The Chicken's Consigliere: In Which Chicken is Touched...read into that what you will. In Which Chicken is Touched...read into that what you will. You'll be happy to know I am not writing about Silver/Purple Lexus tonight. From here on in, my grief is of the private sort. However, my last post about the Lexus elicited a very nice comment and I wanted to share it with you. Thanks for stopping by my blog and leaving a comment. It's always lucky to have a chicken visit. I wandered on over here to have a look and below is the email I just sent my husband at work. I know it is my day off and I had very little planned besides cleaning the house until it sparkled. However , while checking emails this morning (I swear I was only on there for one minute) someone called The Chicken’s Consigliere sent me a message after visiting my blog and I felt obligated to respond by going and looking at her blog which is only polite if someone takes the time to leave you a comment. It only takes 30 seconds and often you don’t need to go back because then you know the person is not a kindred spirit. Hon, I am sorry to tell you that I went to the Chicken Coop, and it is a very very very bad place. I have a feeling I am going to go back to the bad place often, drawn by witty writing, seriously laugh out loud (repeatedly ) comments and a warped view of life I really enjoyed. I ended up spending two hours reading her blog and at one point had to go change my undies from laughing so hard. Get used to having dust bunnies the size of elephants in the hallways, no clean clothes to wear, and dishes in the sink. That chicken rocks and she is funny as hell. P.S. Can you pick up McDonalds and milk on the way home? I didn’t have a chance to organise dinner or do the shopping. I did not copy this in order to self-promote, (well, maybe a little because, hey, she thinks I'm funny, so I must be funny, yay) but mostly to pay it forward because I appreciated the comment, I really love her blog, and I hope you'll check in with her for a visit and leave a comment if you feel likewise. If you feel differently, please do not leave a comment because I don't need QIMP coming back to me and saying, "Crikey, Chicken. WTF. Why you sending all these haters to my blog". That is just bad form. Plus I think Mr. P might have a machete. Please visit QIMP's Blog and let her entertain you. QIMP, thanks so much for the very nice comment. I do believe I have met a Kyndred Spirit and littleb and I will be keeping an eye out for other oreo chocolate treats you might not have down under. 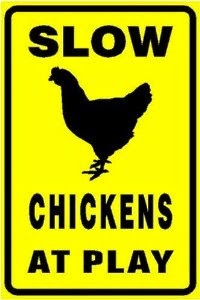 And don't forget to stop by the Chicken Crossing the Road for this post's special gift. Oi! I told you Mr. P was a Ninja Butcher in confidence! Oops. Sorry P family. Don't tell him I told, ok? Awesome. You know I agree with Pyjamas! Chicken I have another friend who has a blog, and on her blog you can vote it "cool" "funny" "unique" I think you should add that feature to your blog. Oh, and I am starting you a fan page on facebook. SS-thank you and you know I feel the same. CB, I will check out you friends blog-I love new blogs. I've seen the "cool, funny" ap, just haven't applied it. I am halfway to a fan page but haven't had the time to complete it (I know, it probably takes a few seconds, right? But technically challenged as I am, it will take be another littleb/work free day, which hasn't happened since "personal day". So thank you. That is awesome! Hi, Chicken... Enjoying your blog, and thanks for the intro to Quilting! Thanks again CB-you truly are a rockstar. I did friend it, just need to take a closer look. Lucky Punk-I had a chance to read a couple of your posts this morning, too, after an excellent 3 hours of sleep. I think we are going to get along jussssst fine. Really enjoyed them. Thank you for reading! Today We Lay to Rest...and other stuff.